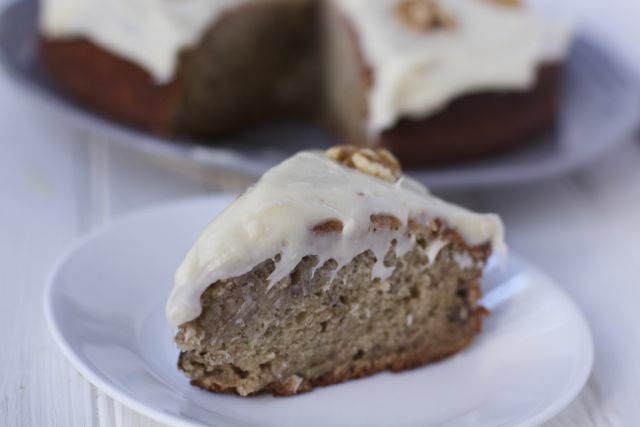 Ina Garten Old Fashion Banana Cake will take you back to your childhood. If you have been a follower for a while you know how much of an Ina Garten fan I am. Ina Garten has come out with yet another cookbook and this will be on my Christmas list. This week I have been staring at a few dark bananas I put in my fridge, waiting to get the energy to bake something. Much to my excitement, I found Ina Garten’s Old Fashioned Banana Cake recipe. 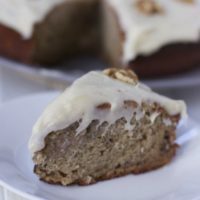 I was not sure what I would think of a banana cake but it had Cream Cheese frosting so how could you go wrong? Like most of her recipes, the old fashion banana cake recipe was easy and straight forward. There is not much fluff in her recipes which I love and just about any level cook can be successful. The cake batter is consistent with a banana bread batter. My family’s favorite part of any cake is the Cream cheese frosting. I could make a double batch and they would eat it out of the bowl. Lather it on, it’s only one layer so you only get to enjoy the top! Have I peaked your appetite yet? Don’t you just want to lick off the frosting? 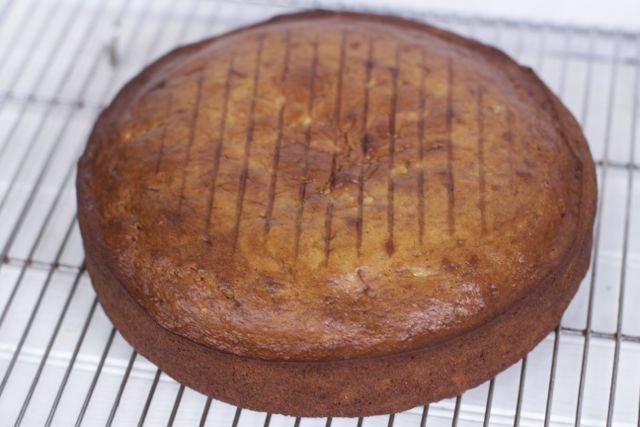 Who is waiting for a slice of this old fashion banana cake? My husband enjoyed it for breakfast the next day too. To make it lower fat, I used the 1/3 last fat cream cheese. You can also try adding 1/2 oil and 1/2 applesauce. Also you can try to substitute some of the flour for whole wheat flour. PREHEAT oven to 350 degrees. 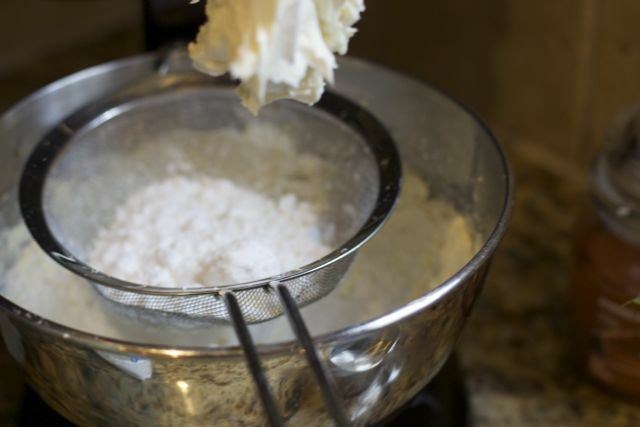 Grease and flour a 9 x 2-inch round cake pan, or line the pan with a piece of parchment or wax paper cut to fit inside the cake pan. Spray the liner and sides lightly with cooking spray. MIX bananas, granulated sugar and brown sugar in bowl with an electric mixer on low speed until combined. Add oil, eggs, sour cream and vanilla. Mix until smooth. Add flour, baking soda and salt. With mixer on low, mix just until combined. Stir in chopped walnuts if using. Pour batter into the prepared pan and bake for 40-45 minutes, until a toothpick inserted in the center comes out clean. Cool in pan for 5 minutes, turn out onto cooling rack. Serve warm, sprinkled with powdered sugar, or cool completely and top with Cream Cheese Frosting. MIX cream cheese, butter and vanilla in the bowl of an electric mixer fitted with paddle attachment on low speed until just combined. Don’t whip. Add sugar and mix until smooth. PREHEAT oven to 350 degrees. Grease and flour a 9 x 2-inch round cake pan. MIX bananas, granulated sugar and brown sugar in bowl with an electric mixer on low speed until combined. Add oil, eggs, sour cream/yogurt and vanilla. Mix until smooth. Add flour, baking soda and salt. With mixer on low, mix just until combined. Stir in chopped walnuts if using. Pour batter into the prepared pan and bake for 40-45 minutes, until a toothpick inserted in the center comes out clean. Cool in pan for 5 minutes, turn out onto cooling rack. 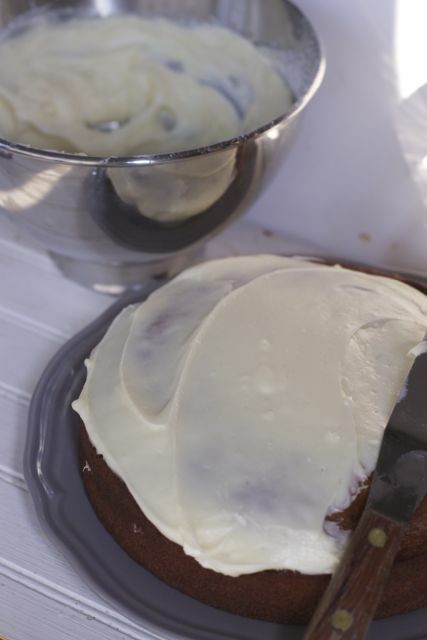 Allow to cool completely and top with Cream Cheese Frosting. MIX cream cheese, butter and vanilla in the bowl of an electric mixer fitted with paddle attachment on low speed until just combined. Add sugar and mix until smooth. Spread on top of cooled cake layer. 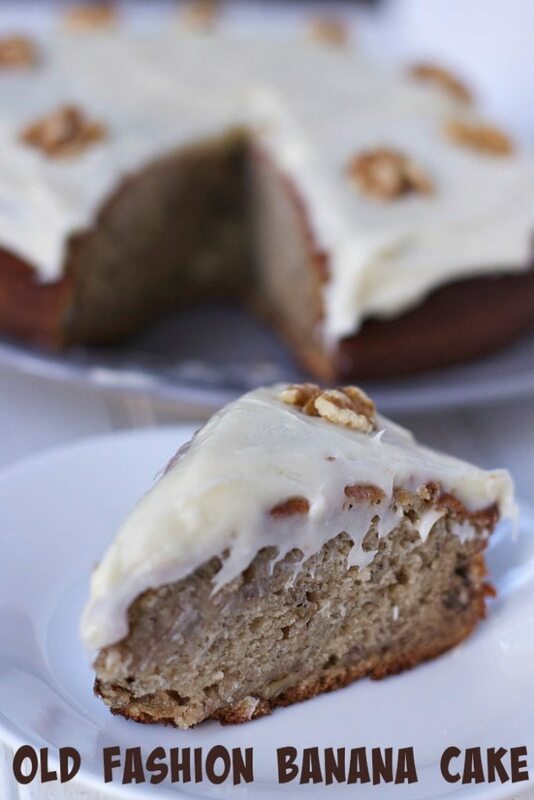 Have you ever made an old fashion banana cake recipe before? 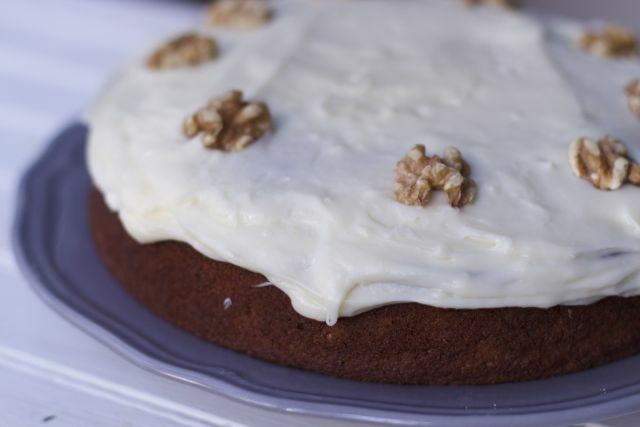 Nothing beats an old fashioned banana cake with cream cheese frosting and walnuts! Easy and very delicious! No, I’ve just made a regular banana cake and a Nutella filled, coffee glazed one that everyone loves. I am not a huge banana person but banana cake is really good!